Cutrine Plus is liquid algaecide containing 9% metallic copper as the active ingredient. It is effective in controlling a broad range of algae including planktonic, filamentous, and benthic. ALGAE CONTROLLED: Planktonic (suspended) forms such as Cyanobacteria (Microcystis, Anabaena, and Aphanizomenon), Green algae (Raphidocelis and Cosmarium), Golden algae (Prymnesium parvum), and diatoms (Navicula and Fragilaria). Filamentous (mat-forming) forms such as Green algae (Spirogyra, Cladophora, Ulothrix, and Rhizoclonium). Benthic (bottom-growing) forms such as Chara and Nitella. Effective control of algae requires direct contact with all cells throughout the water column. Calm and sunny conditions when water temperature is at least 60F will usually expedite control. Visible reduction in algae growth should be observed in 24 - 48 hours following application with full effects of treatments sometimes taking 7 - 10 days depending on algae forms, weather, degree of infestation and water temperatures. APPLICATION RATES: Application rates range from 0.6 - 3.0 gal/acre-ft of water (0.2 - 1.0 ppm). For effective control, proper concentration must be maintained for a minimum of three hours contact time. For help in determining acreage and volume, please visit our Acreage and Volume Calculations page. 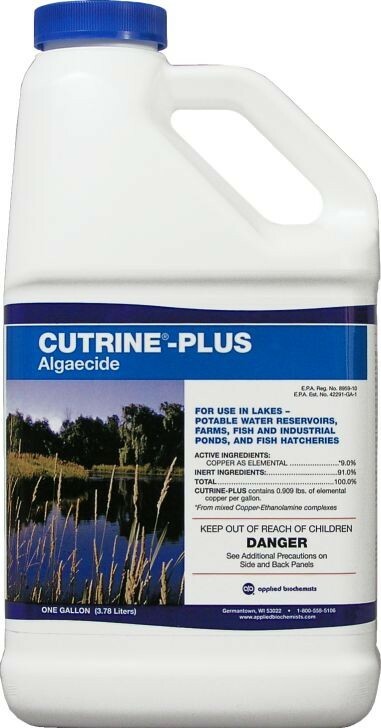 USE RESTRICTIONS: Waters treated with Cutrine-Plus may be used for swimming, fishing, further potable water treatment, livestock watering or irrigating turf, ornamental plants or crops after treatment. Do not use in waters containing Koi or hybrid goldfish. Not intended for use in small volume, garden pond systems. Information above is provided as a reference only. Please consult the label and MSDS for full detailed information on application rates and use restrictions. Not Available in CA, CT, MA, ME, NH, NJ, NY, OR, RI, WA, VT.